NOTE: Product will be available after October 5, 2016. 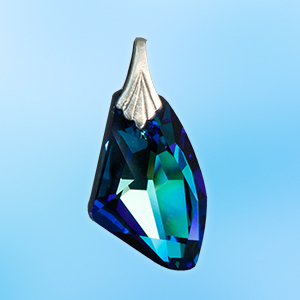 The new Galactic Blue Bermuda Crystal pendant from SWAROVSKI ELEMENTS is one of the most innovative we have seen in years! The top edge has a matte finish and the rest is done with classic SWAROVSKI ELEMENTS sparkle and precision facets. The organic glitz in this SWAROVSKI ELEMENTS crystal is unsurpassed in cut, quality and design.